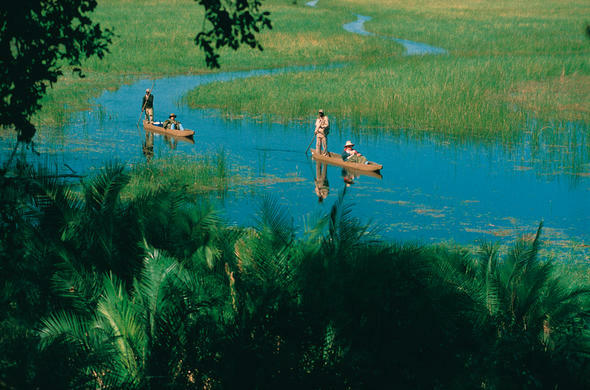 The Okavango Delta in Botswana is renowned for its exceptional beauty but even in the Delta itself are areas that redefine our understanding of wilderness and environment. The south western Okavango Delta, also referred to as the seasonal delta, shows dramatic changes in physical attributes over the seasons, with grasslands changing to shallow waterlogged plains during the dry season before reverting back to grassland with the receding of the flood. It is here on the south western floodplains of the Okavango Delta that some say the Creator produced his finest work. Here the natural beauty is overpowering - around every treeline and behind every island is a new wonder. There is no better place that shows the drama of the seasons of the Okavango than the south western floodplains. It is here where the water drains away before and after the rainy season and then floods the plains again in the dry season. The flooding and drying of the Okavango Delta varies from year to year, and in some seasons of excessive local rain the floodplains may fill up, but generally the cycles work to the flooding of the delta in the dry season. Wildlife is plentiful in the Okavango Delta and the natural beauty astounding, and it could be for these reasons that the most dramatic feature of this unique wilderness has been overlooked until recently. The annual flooding of the delta is surely one of the most dramatic natural occurrences on earth.